← What is it with drivers!? 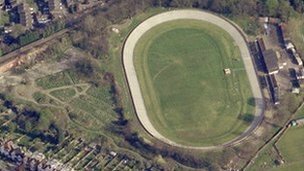 A venue from the 1948 London Olympics still in active use has been given a cash injection to help create a lasting legacy for next year’s Games. number of people participating in sport in the south London borough. The velodrome reopened last month after a £500,000 refurbishment. of a project funded mainly by British Cycling. The money from Southwark Council will also fund a new building to support training, cycle storage, changing and refreshment facilities. development and outdoor disability multi-sports court. Peckham Pulse pool hoist, Peckham Rye pitches and changing rooms, Southwark Park sports complex and Trinity College Centre outdoor sports area also benefited from the cash handout. This entry was posted in Biking and tagged Fixed Gear, Fixie. Bookmark the permalink.